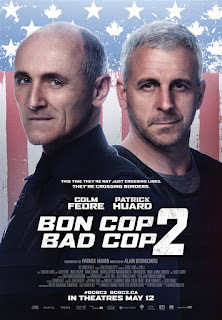 Bon Cop Bad Cop wasn't a great movie. It was formulaic and a bit corny. But what made it so much fun to watch was the spirit of it, the way it skewered Canadian identity politics in a clever and lighthearted way. So the idea of a sequel sounds like fun but I guess the execution of that just didn't pan out. The plot remains formulaic and the jokes remain corny. The film makers once again are copying a cheap American buddy cop formula wedged into a Canadian context. But this time most of that self-referential and self-depreciating humour is missing, instead focusing our attention more on the predictable story and a hammy family based story which never feels authentic. Basically what made the first film charming is gone from 2. The creation of Canadian identity mythology is still there. The plot hinges importantly on the differences that separate Canadians from Americans (and therefore unite disparate Canucks) but it's so in your face it's hard to take seriously. And the jokes just aren't that funny. I found the characters were laughing at their own jokes more than the audience was. And, as in the first, the film makers' idea of Canadian identity is relegated to the Ontario/Quebec two solitudes, leaving the rest of the country out in the cold. Ah well, there is still time for the trilogy to end with these two cops going on a road trip up north picking up a new agent who is neither white nor male nor from central Canada. Come on guys, end this series well.